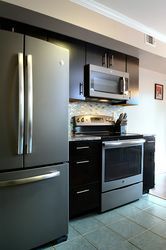 LOUISVILLE, Ky. — November 25, 2014 — Households across the country have been incorporating gray shades into kitchen décor and, thanks to GE, even into appliances. 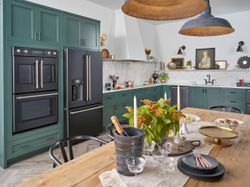 The company’s Slate premium appliance finish, a warm, gray, metallic hue with a matte look, has proven to be a natural complement to a range of consumer kitchen needs. 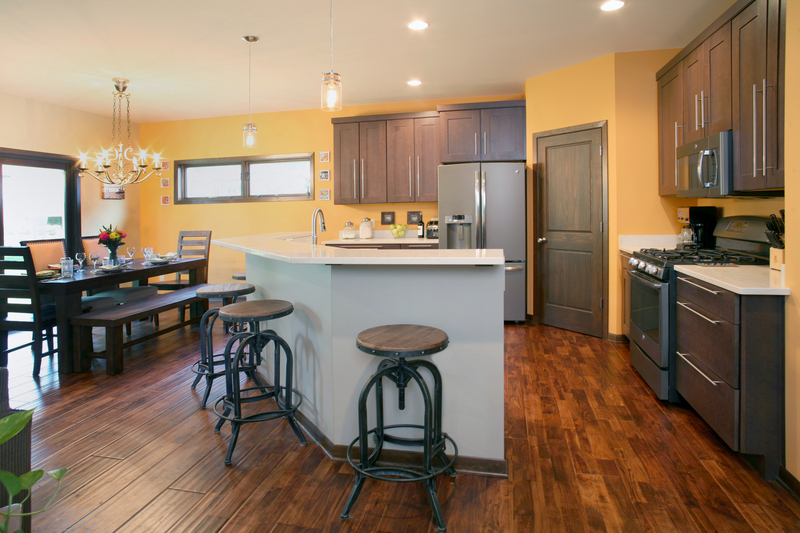 New construction – The Geiers (Louisville, Ky.) chose to build a new, smaller home, but didn’t want to lose the classy feel of their previous kitchen. 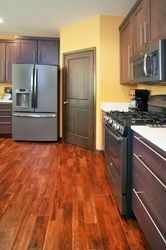 Slate gave their new kitchen a high-end look while also complementing the standard materials used by the developer to build their new home. 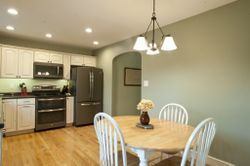 Kid-friendly – Kelly Reyes and Sean McClernon (Virginia Beach, Va.) and the McHughs (McFarland, Wis.) have young children, and they found that Slate’s resistance to fingerprints, smudges and dirt made it easy to maintain and a perfect fit for a family environment. 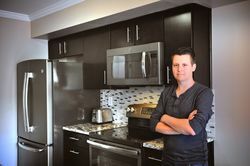 Black and white – Sebastian Modelowski (Ballston Spa, N.Y.) and Zane Miller (Christiansburg, Va.) learned that Slate can be incorporated into both light and dark decors. 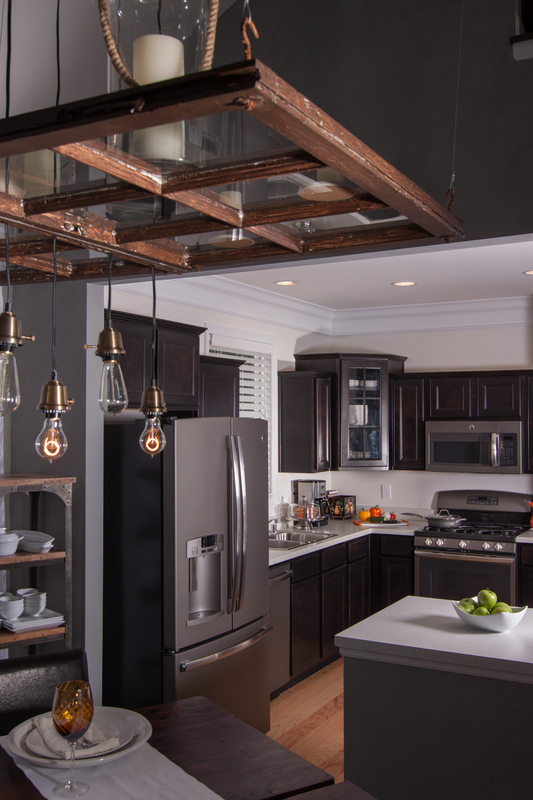 Modelowski chose black cabinets and an overall darker tone, while Miller chose white cabinets and light wood for a distinctly brighter feel. 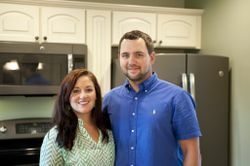 Starting Over – The Mitchells (Ocean City, N.J.) have a special story: Hurricane Sandy destroyed their home, and they were forced to start over. 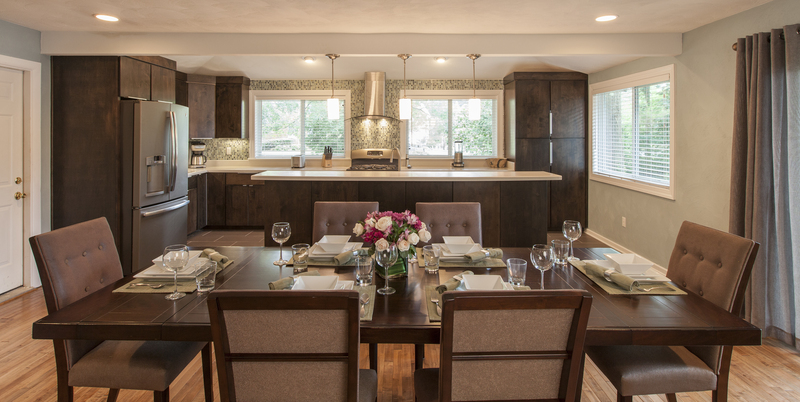 The couple seized the disaster as an opportunity to get the kitchen they always wanted and chose Slate because it offered a completely new style for them. 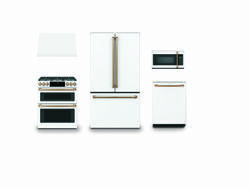 GE Appliances initially launched Slate in September 2012, expanded it in 2013 and announced a second expansion and collaboration with Pfister kitchen and bath faucets in July 2014. 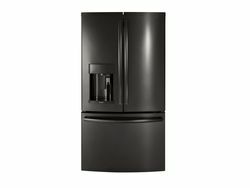 Please contact GE Appliances for more information on the Slate finish, additional images or for interviews with the above families on the kitchen designs. 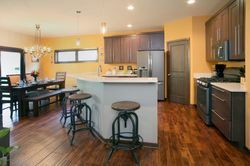 Sebastian Modelowski in Ballston Spa, N.Y.
GE’s Slate finish complements transitional designs while delivering on today’s muted color scheme. 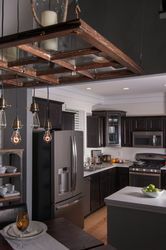 Slate complements a variety of decors, including Sebastian Modelowski’s choice of black cabinets and an overall darker tone. 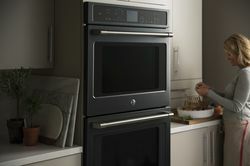 GE’s Slate finish provides consumers with quality options for the growing trend of using a neutral gray scheme. 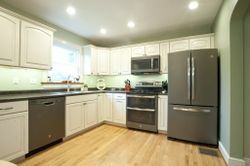 Zane Miller in Christiansburg, Va.
Zane Miller chose Slate appliances to complement his white cabinets and light wood for a distinctly brighter feel. 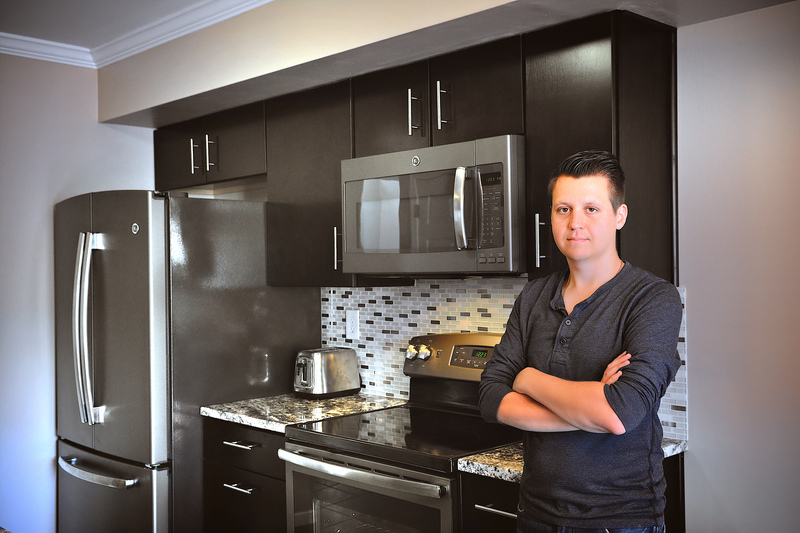 Zane Miller and his girlfriend pose with their Slate appliances at their home in Christiansburg, Virginia. 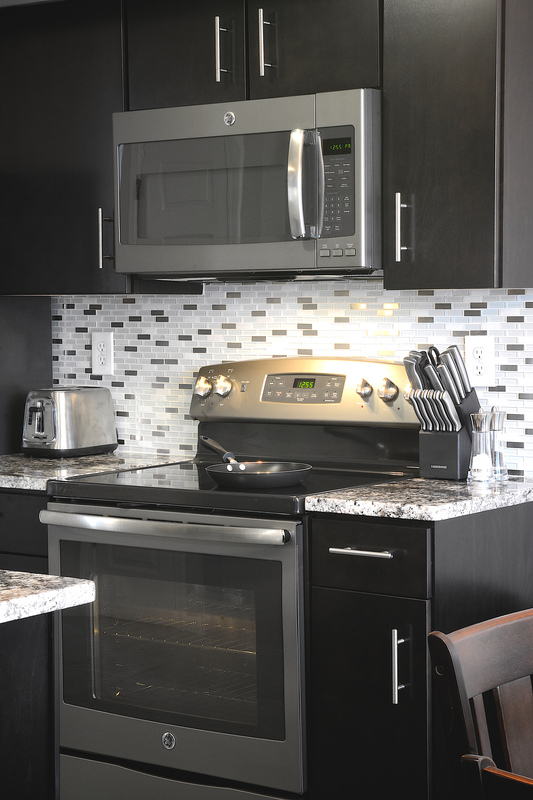 Slate complements a variety of decors, including kitchens with an overall lighter tone. 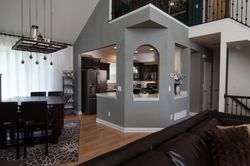 The Geiers in Louisville, Ky. Slate gave the Geier’s (Louisville, Kentucky) new kitchen a high-end look while also complementing the standard materials used by the developer to build their new home. 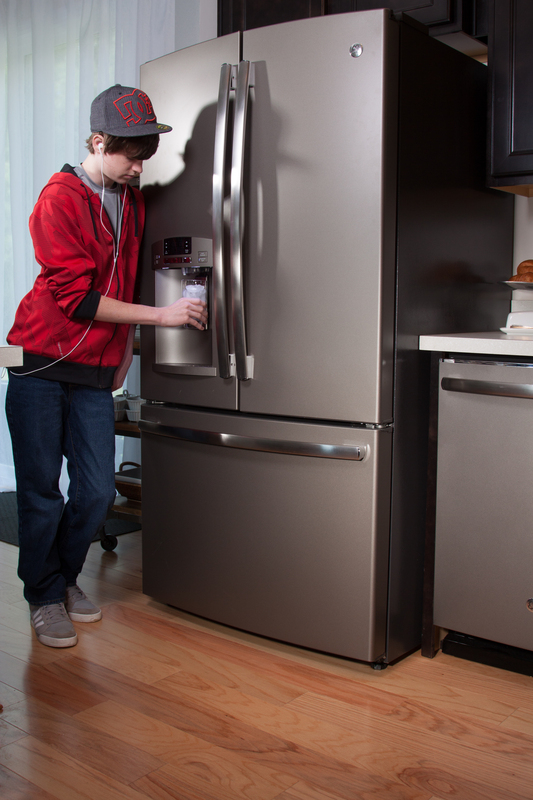 Slate’s resistance to fingerprints, smudges and dirt makes it easy to maintain and a perfect fit for a family environment. 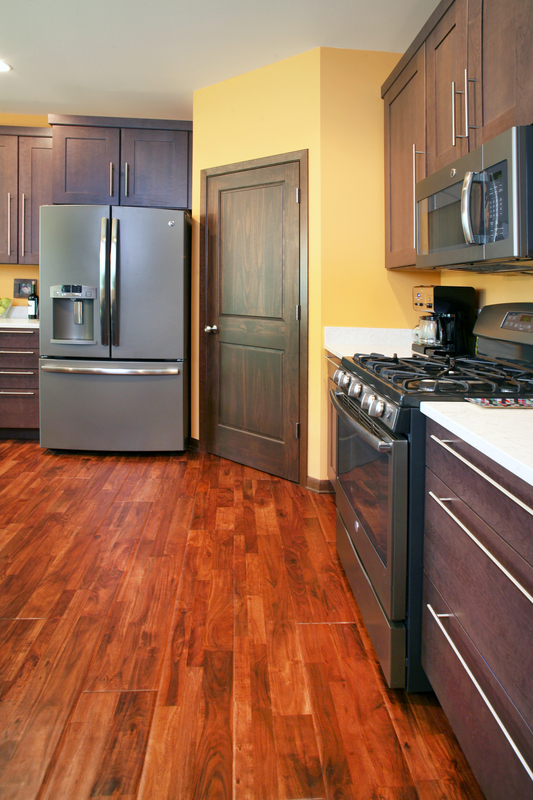 Slate complements a variety of decors, including kitchens with an overall darker tone. The McHughs in McFarland, Wis. 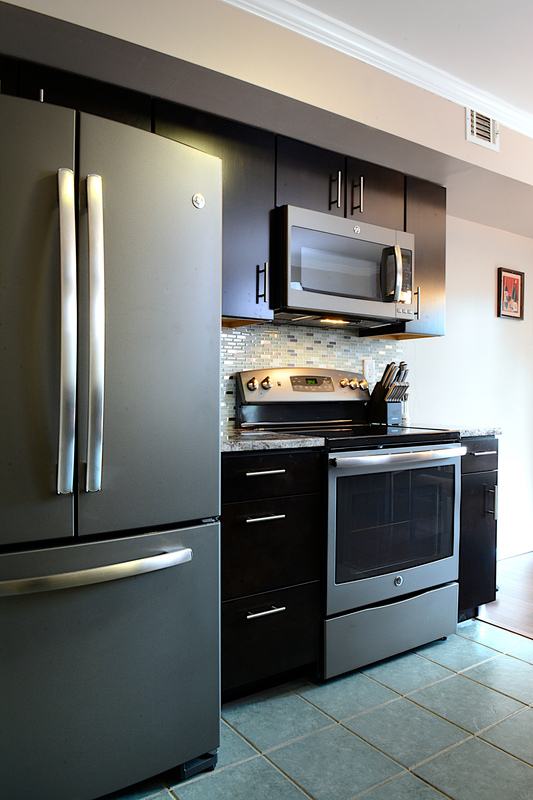 Slate's low-gloss, warm gray finish offers an inviting alternative to stainless steel and complements popular kitchen décor. 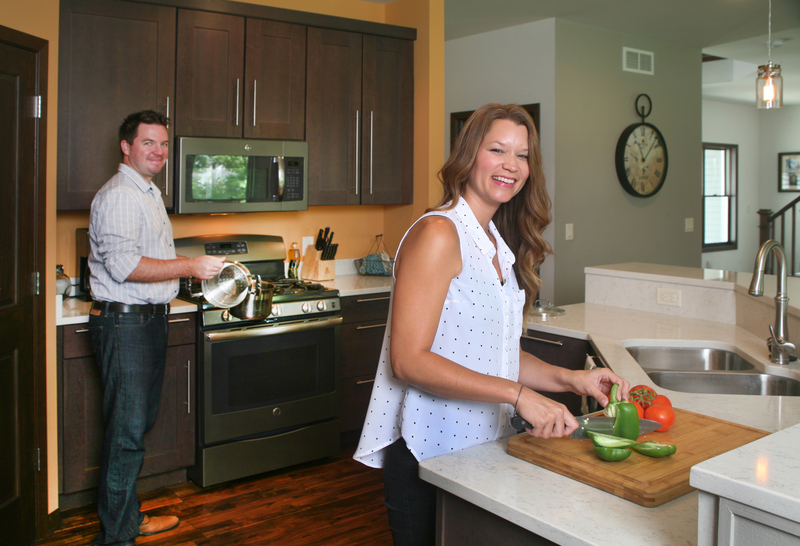 Marissa and Jason McHugh prepare a meal using their Slate appliances. Slate’s finish is adaptive, allowing it to seamlessly blend into kitchens that flow into the rest of the house, making it ideal for today’s open-concept living. Kelly Reyes and Sean McClernon in Virginia Beach, Va. Slate appliances have a deep, warm and inviting look that exudes refinement and sophistication. 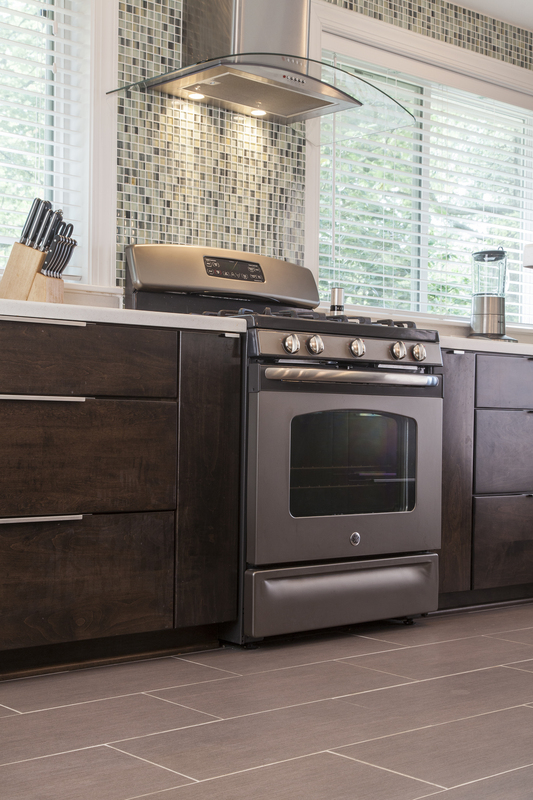 Slate appliances complement a wide spectrum of materials and finishes that are found in traditional kitchen design. 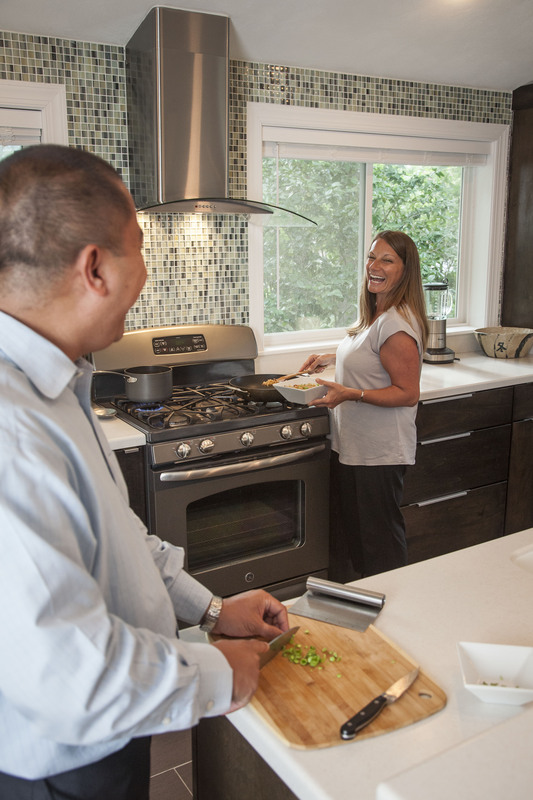 Kelly Reyes and Sean McClernon enjoy cooking a meal with their Slate appliances.